December 28, 2018, Adrian, Michigan – As we continue the Season of Christmas and head toward New Year, we also take time to look back at the past year and remember the highlights. For the Adrian Dominican Sisters and Associates, 2018 was a year of many challenges, triumphs, and sorrows. Below are the highlights of the year as found in the “What’s Happening” news section of our website and chosen members of the Communications Department. Adrian Dominican Sisters and Associates were involved in the national efforts to halt gun violence in the United States. While many Sisters and Associates participated in marches against gun violence, people of faith in corporate responsibility organizations took a different approach. 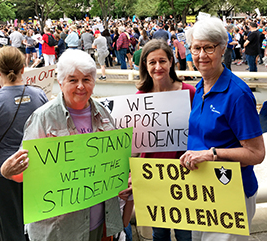 Sister Judy Byron, OP, helped to organize religious communities in the Interfaith Center for Corporate Responsibility to buy stock in gun manufacturers and dealers. Through shareholder resolutions, they scored a victory in persuading American Outdoor Brands, the parent company of Smith and Wesson, and Sturm Ruger to be more transparent and to work toward gun safety. As policies on immigrants were debated or enacted, Adrian Dominican Sisters and Associates advocated on the immigrants’ behalf. 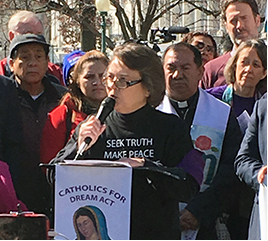 Actions included participation in a February 26 call-in to urge Congress to enact legislation to extend the option for Dreamers to defer deportation; took part in the Catholic Day of Action for Dreamers; and submitted comments to the U.S. Citizenship and Immigration Services against a proposed policy that would make it harder for immigrants to become citizens. Toward the end of the year, Sisters volunteered at hospitality centers in Texas, working with immigrants who had been released from detention and were on their way to sponsored homes in the United States. The Congregation mourned the loss of two women who had served as Prioress of the Congregation: Sister Rosemary Ferguson, OP (1968 to 1978), who died on April 17, 2018, and Sister Janet Capone, OP (1998-2004), who died on July 29, 20018. Sisters and Associates represented the Congregation at a number of major justice advocacy events throughout the year, including Ecumenical Advocacy Days for Global Peace with Justice; the Walk for Life in the Philippines, protesting the extra-judicial killings of accused drug dealers and users; Encounter at the Border, the annual action of the School of the Americas (SOA) Watch; and the Parliament of World Religions. Individual Sisters and Associates continued to be involved in justice ministry in a number of ways. Sister Lois Paha, OP, led a delegation of 50 Hispanic parishioners from the Diocese of Tucson to the Fifth National Encuentro, focusing on ways that the Catholic Church can be more responsive to the needs of Hispanic Catholics. Sister Durstyne Farnan, OP, spent days on NETWORK’s Nuns on the Bus in the days before the election, helping voters throughout the United States to understand issues of economic justice. In August, Adrian Dominican Sisters from the Dominican Republic, the Philippines, the United States, and invited Sisters from other U.S. Dominican Congregations, all 65 and under, gathered in Adrian to deepen their relationships and to look ahead to the future. 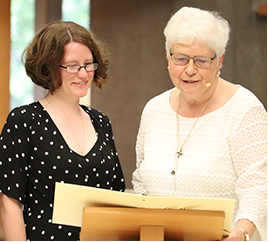 A highlight of the gathering was the First Profession of Vows of Sister Katherine Frazier, OP. Sister Xiomara Méndez-Hernández, OP, was named to serve the core team of Giving Voice, an organization for Catholic Sisters 50 and younger. The Congregation welcomed several new Associates – lay women and men who make a non-vowed commitment to live out the mission and vision of the Adrian Dominican Sisters – from Florida and the Dominican Republic in April; from Adrian during Partners VI, the annual summer gathering of Associates in August; and from Chicago in October. 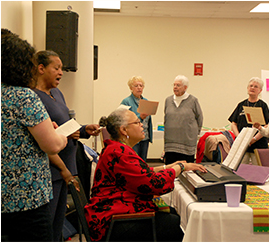 The Congregation collaborated with and hosted other members of the national and worldwide Dominican family: Friars, contemplative nuns, apostolic Sisters, Laity, Associates, and members of established Dominican organizations. Sisters Rose Ann Schlitt, OP, and Nancy Jurecki, OP, along with Gloria Escalona, of the Dominican Laity, formed a delegation of U.S. Dominican women to visit the Dominican Sisters of the St. Catherine of Siena Congregation of Iraq after they returned to their demolished and damaged homes and convents on the Nineveh Plain. Sister Margarita Ruiz, OP, collaborated with other women religious to write a history of women religious in the Dominican Republic. The Adrian Dominican Sisters hosted the Dominican High Schools Preaching Conference and the annual gathering of the Dominican Institute for the Arts. 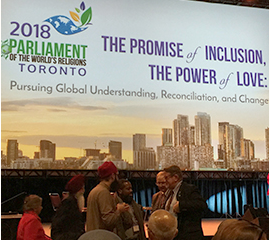 The General Council of the Congregation issued statements on a number of issues, including offshore drilling, President Donald Trump’s rollback of pollution controls, the mass shooting at Tree of Life Synagogue, the U.S. withdrawal from the Iran Nuclear Deal, clergy sexual abuse in the Catholic Church, Martin Luther King Day, and the separation of immigrant children from their parents. Proclaiming 2018 to be a year of study on the meaning of resilient communities, the Congregation hosted two public forums on the subject: a symposium in March, featuring talks by five national thought leaders on various aspects of resiliency and an educational forum in August, in which three Adrian Dominican Sisters shared their own stories of forming resilient communities. Mission Chapters have formed their own Resilient Communities Committees to determine where in their region they will work with local people to make their community resilient. In the spring, two workshops in Michigan helped participants to engage in the difficult conversation about diversity and racism. 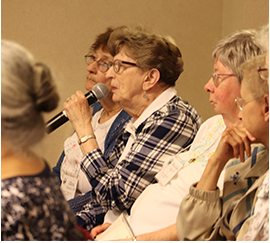 Sister Anne-Louise Nadeau, SNDdeN, and Sister Patricia Chappell, SNDdeN, of Pax Christi USA, led a public workshop, “Breaking the Silence: Confronting Race, Power, and Privilege.” The Great Lakes Mission Chapter, based in Detroit, focused its Spring Assembly on Racism and White Privilege. A unique program, Reverse Mass Mob, brought parishioners from Detroit to a suburban parish to begin their conversations on racism. In response to the General Chapter Enactment on Sustainability, administrators at the Motherhouse Campus developed a sustainability plan, which includes changes in the heating and cooling system and reduction in the use of electricity at the Motherhouse. Students from Barry and Siena Heights Universities, both sponsored by the Congregation, came together at the Permaculture Gardens in Adrian site in May to learn about sustainability practices and apply them on their own campuses. 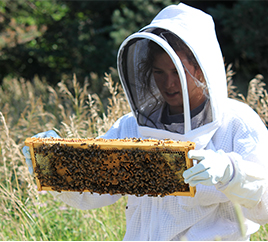 Elaine Johnson, Permaculture Specialist, introduced honeybees to the Permaculture site. The 2018 issue of Voices in Mission and Ministry details sustainability practices throughout the Congregation. October 30, 2018, Adrian, Michigan – The General Council of the Adrian Dominican Sisters issued the following statement in response to the recent murder of 11 people at the Tree of Life Synagogue in Pittsburgh. Our hearts ache at the horrific anti-Semitic crime that has claimed the lives of 11 of our Jewish brothers and sisters at the Tree of Life Synagogue in Pittsburgh, and injured six other people, including four police officers. We pray for the victims, their grieving families and friends, and the surrounding Squirrel Hill community as they mourn and seek healing. There is no place in our country for the white nationalist rhetoric and too-often ensuing violence that has been savagely leveled against our black, brown, Muslim, Jewish, Native American, immigrant, and LBGTQ brothers and sisters. We are all God’s children, together comprising the beloved community of Dr. Martin Luther King Jr.’s dream as inspired by Jesus. We join with all people of faith and goodwill who refuse to let hatred and fear find a place in our hearts, kindling instead our capacity to love. 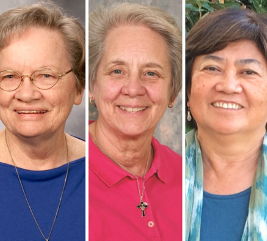 Members of the General Council of the Adrian Dominican Congregation are Sisters Patricia Siemen, OP, Prioress; Sister Mary Margaret Pachucki, OP, Vicaress and General Councilor; Sister Frances Nadolny, OP, Administrator and General Councilor; and Sisters Patricia Harvat, OP, and Elise D. García, OP, General Councilors.